Do you make this common trading mistake? What is the Commitments of Traders? Is your Broker watching you? What broker should you use? How can the Commitment of Traders help you? among private traders but research suggests that their popularity doesn’t translate into trading success, with both markets among the worst performers for private traders in terms of win percentage, so what is going wrong? One reason for this I believe is, and this might sound very obvious but Gold and Silver are real, they exist not like the Euro or US dollar or British pounds etc. They have a physical form with real world applications and for this reason these markets behave differently and are traded by a different kind of trader so you must think as these traders do. Another reason I believe there is such a poor performance is the fact these markets are among the most talked/written about by analysts or economists and their theories are often wildly divergent with some claiming Gold is destined for $700 while others claim it will be back touching $2000 before we know it. Each wild claim being made on the grounds of central bank hording or market manipulation or whatever other opinion they care to try to sell. Headlines like these affect your views whether you realise it or not and they have a massive effect on your trading. Taking all these factors into account, the only people I choose to ‘listen to’ when trading these markets are the people who physically buy and sell them. Not just trade them but actually exchange the physical product/material being traded, the produces who are selling it and the merchants who are buying it. They know these markets better than any analyst, economist or trader and it’s only these people who know where this market is headed. Let’s take a look at Gold and Silver recently to show you what I mean. 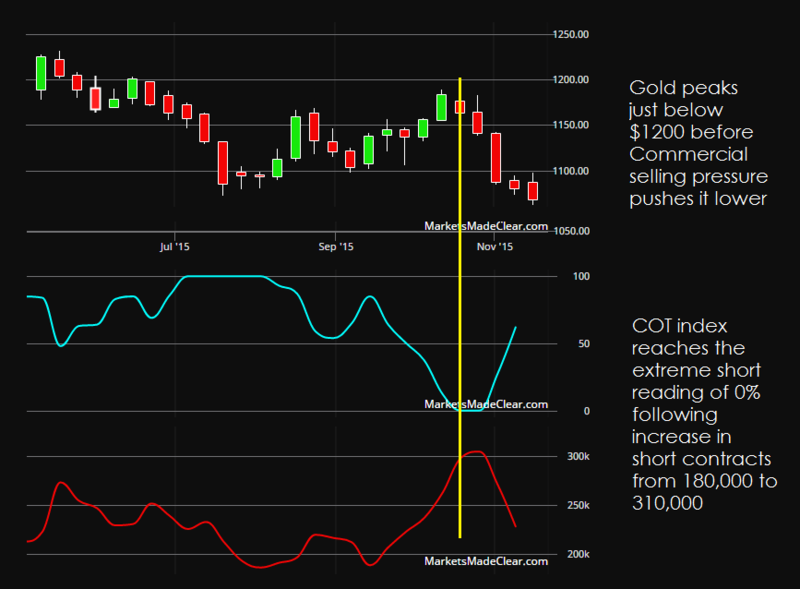 In the chart below you can see a price chart of Gold along with a COT index (blue line) which measures the imbalance between buyers and sellers, and the true number of short contracts (red line) held by commercial traders. Through August and September the price of Gold rose slowly to just under $1200/ounce, during that time commercial traders (producers) used this increase in price as a time to sell large quantities of Gold, increasing their short contracts from 180,000 to over 300,000. At a current value of $107,700/contract, you can start to appreciate the volume of money these traders are using and why I want to know what they are doing with it. The COT index (blue line) then registers an imbalance towards sellers by hitting 0%, at which point the market turns and rolls over under the weight of commercial selling. The same is also true of Silver. In the last few month’s commercial sellers of the shiny metal have twice sold in large enough quantities as to register an imbalance towards sellers and force the price lower. Both times the COT index reached 0% following a sharp increase in commercial selling, and both times it has sent Silver into a multi week decline, the most recent of which we are still currently in. Fig 2. 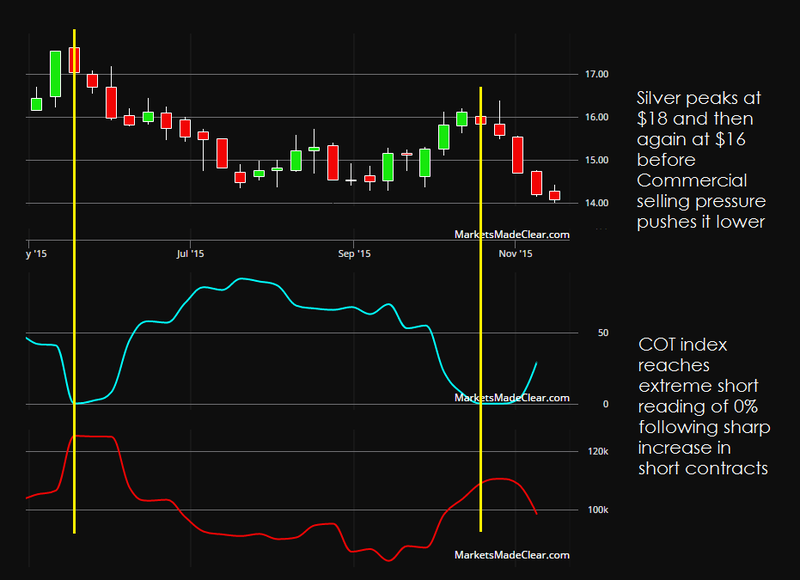 COT data for Silver showing COT index and commercial short contracts. Trading in this manner requires a shift in thinking as it will mean most private traders changing from being a reactive trader (reacting to what is happening on the chart) to a proactive trader (preparing for the expected price changes you believe will be brought about due to the buying and selling patterns of large traders). Patience and planning become much more important, but as a result the markets become a lot less unpredictable and stressful. Next time you’re thinking of trading Gold or Silver, try having a look at which way the real money’s going first. Receive the best tips and most up-to-date information directly in your inbox.